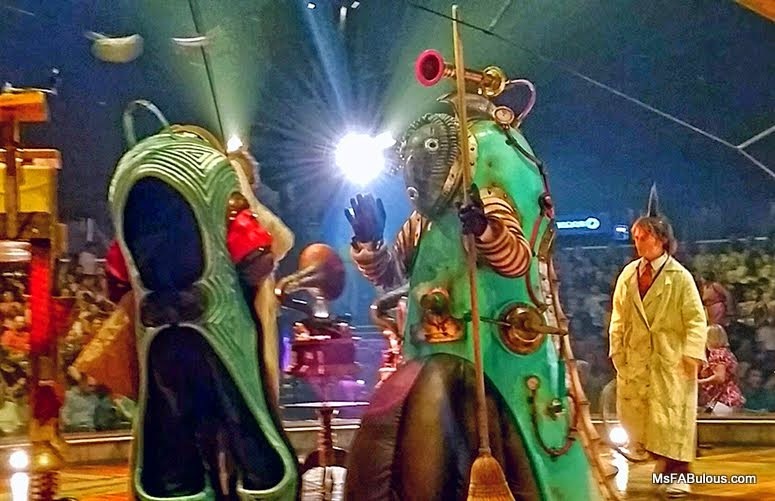 Cirque du Soleil's latest production Kurios on tour now is pure Steampunk heaven! Before you even reach the blue and yellow striped tent, you encounter magical gears, old-timey photographers and a primitive penny farthing bicycle contraption. You have your signature Cirque du Soleil artistic feats of acrobatics. Of course, they don't sell their tickets purely on technical skill. It's the artistic vision of how they present their acts that entice me to fly to another country just to catch the show at the beginning of the tour. While Steampunk style encompasses a science fiction twist to a vintage aesthetic, the cultural history it pulls from is not defined. Cirque du Soleil pulls beautiful interpretations of Steampunk for their diverse, International cast. European, Asian, American retro styling is given an industrial age twist. Just when you think you have the entire theme figured out or you think you can no longer be surprised, they surprise you again. There was an act that played out like a quirky tea party where the point was to see the acrobats stack everything higher and higher in a gravity-defying feat of balance and height. The basic concept has been seen though not as stylishly. THEN the lights panned up and you see that acrobats from the roof of the tent are creating the exact scene upside-down in a mirror image to connect to the original act. It was positively inspired. If you are lucky enough to have the opportunity to visit a city on this tour, Cirque du Soleil Kurios is not to be missed!